What a great way to spend an evening–listening to stories, drinking wine, and looking at my photographs! This Friday and Saturday evenings I will be displaying photographs from my research work on how the wine industry affects the aesthetic of the Okanagan Valley. See the press release below for more details . . .
Come and taste wine while savoring stories from/about Peachland with Vancouver Artist David McIntosh. Photography exhibit by Andrew Barton. WHO: David McIntosh and Andrew Barton. Seats are limited! Phone 250-807-9648 to reserve tickets. Donations at the door! For one week in October, performer David McIntosh will be searching out Peachland stories and sampling wine from Peachland vineyards. Enjoy a surprising and unpredictable Peachland evening, as he shares stories he’s discovered with wines that he’s tasted! Taking advantage of McIntosh’s training as a sommelier and the ergonomics of serving wine, this unique storytelling performance allows for the consideration of our bodies as vessels of myth, history, lies, desire and geography. Over the last five years Vancouver Theatre company Battery Opera’s David McIntosh has been creating site-specific works that explore the traces of lives lived amongst the structures and histories that surround us. Andrew Barton’s photography takes another kind of look at “Terroir”— the exhibit will be an interactive display that will invite guests to “pair” quotes from local vineyard proprietors with stunning photographs of Okanagan wineries. 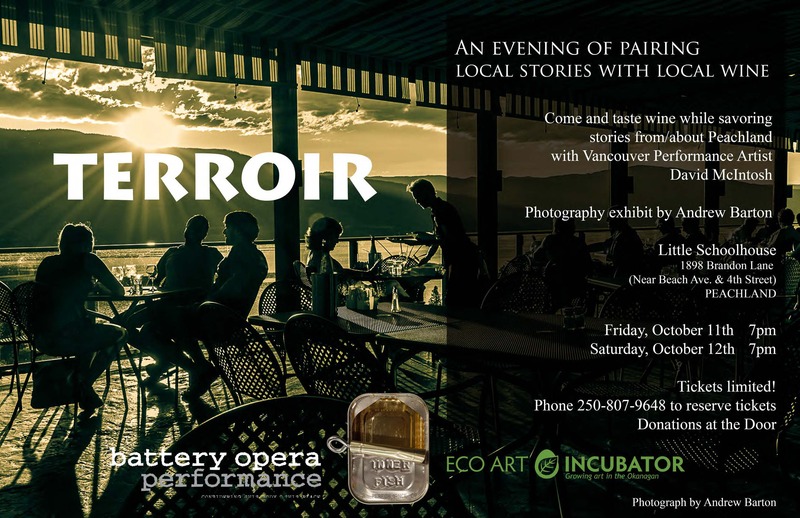 Event is sponsored by Innerfish Performance Company, the Eco Art Incubator and the Okanagan Sustainability Institute.